Navigating through countless wedding forums, blogs and wedding planning resources available online can be overwhelming and stressful. For many couples planning their wedding online, connecting with other couples going through the process and hearing advice from couples who just had a wedding can be invaluable resources of information. Since 2009, Love My Dress has swiftly become one of the UK's leading and most influential wedding blogs. The blog receives half a million page hits a month and inspires brides all over the world. It has been quoted by Elle Magazine as being amongst the top five blogs in the world dedicated to inspiring brides. Love my Dress founder and Style Me Vintage author Annabel Beeforth shares some words of wedded wisdom in our latest Q&A. What inspired you to start Love My Dress? I got married in 2009 and without realising it during the planning process, I completely fell in love with the world of weddings. I discovered a lot of new suppliers I'd never heard of. I felt immersed within this beautiful, creative scene. I really was in my element. Whilst planning, I'd regularly frequent an online forum under the username 'lovemydress' - it was quite common for newlyweds to share their 'wedding reports' after their wedding days had passed. I took great pleasure in sharing mine in creative writing style. It blew me away at the time that my little wedding report instalments (I shared them like chapters of a book when I had time) were being read by thousands. Blogs in the UK didn't exist back then but Style Me Pretty (RIP) in the USA did and this partly inspired me to set up my own site to share my wedding story and details of the suppliers I'd discovered. I had no plan, no strategy, I had no idea my passions would turn into a business opportunity that would change my life. It was a real serendipitous moment in many ways. A culmination of being in the right place at the right time before the blog scene exploded. I was contacted very early on by a number of London based designers who had spotted what I was doing and wanted to be a part of it. This introduced me to a key creative scene and helped me learn the importance of getting out there, making contacts and learning more about the wedding industry. What were some of the biggest challenges for you when you were planning your own wedding? Overcoming tradition and stuffiness. Our venue owner was determined we'd do things her way, which was very much the old traditional way - cutting of the cake, first dance etc. All elements I actually felt quite uncomfortable with but caved into because I felt I had to. Things are different now. Which content on Love My Dress attracts the most readers? Real wedding content and opinion pieces are our most popular content. Love My Dress readers are not just interested in pretty and beautiful weddings, they also enjoy intelligent articles and inspiring stories. We introduced our 'From The Heart' feature articles in 2016 which allowed us to explore broader 'life' and non-wedding content. This was a precursor to our new lifestyle blog A Life Loved. Your ‘Real Weddings To Inspire’ posts are a great way to introduce couples to venues, wedding photographers and other wedding suppliers. How do you source so many great weddings to feature on Love My Dress? Thank you! We're exceptionally lucky. 99.9% of the weddings we feature come to us as submissions. I may stumble upon a beautiful wedding on Instagram and will always ask if we can share if I love it, but most of our content is sent in to us. Having been around since 2009 and established such a good reputation both with consumers and professionals is helpful in that respect. Your ‘Words Of Wedded Wisdom’ features are great too, giving married couple a chance to share advice on their wedding day and some of the issues that came up. What are some of the most helpful words of wisdom that you have shared over the years? Oh my gosh, so many! I love sharing the words of wedded wisdom and wish I had time to collate them altogether. One day maybe :) Consistently, we hear brides telling other readers not to worry about anything in the run up to your wedding day because on the day itself, the love and joy will overshadow any small mishaps or things that didn't go perfectly to plan. Also, to be brave and decisive in making decisions. Perhaps the most repeated piece of advice we see however is to focus on the purpose of the day and remember why you're there in the first place. Don't stress over napkin colours! Forget the bells and whistles. You're making a public declaration of togetherness, for life so remember to focus on that throughout the day. What tips can you offer to help reduce the stress in planning a wedding ? One of the best pieces of advice I can give is find a great online community like the one we have in our closed Facebook group. It can feel very isolating planning a wedding but knowing you're not alone struggling to manage budget or when you're paining over your guest list and those awkward relatives you really don't want to invite, then the stress can be reduced by sharing your woes with a supportive community that have your back. Investing time in developing our Facebook community has been absolutely key this past 2 years. We now have over nearly 4,000 members and because it's a safe and moderated space, member feel comfortable sharing some quite serious issues that have been the cause of stress; illness, family or monetary issues. But step away from the screen too. There is so much noise out there through social media, the landscape is saturated with images of perfection, it's easy to reach wedding planning overwhelm. Perhaps promise yourself a day a week where you completely switch off from it all to help gain a health perspective and reduce stress levels. Dry hire venues allow couples the opportunity to create a personal and unique space for their wedding. Are you seeing a shift in couples moving away from traditional wedding venues or hotels into alternative wedding venues or warehouse venues like Shoreditch Studios and Kachette? Not necessarily a shift, but we're certainly seeing more of this kind of wedding coming through. I agree in that I think one of the great appeals of a dry hire venue is that it offers the couple a chance to create a really unique day for themselves, because there's no sense of package or set structure or sense that your wedding is a carbon copy of someone else's. One thing I would say about dry hire venues is, consider a bit of help from a wedding planner who has great contacts. They'll help alleviate some much of the 'wedmin' stress and in so doing enable you to enjoy the lead up to your wedding day. There are so many different types of wedding venues in the UK, what should couples consider when deciding on the right venue for their wedding day ? The key things to consider are space and capacity foremost, then whether the venues will allow your own choice of suppliers or if they have their own, or in-house team they prefer to work with. Check things like accommodation, corkage fees, if confetti is allowed, whether they have a late night licence, etc. Is catering on site? Will additional hired in furniture and/or props and lighting be required? What about entertainment, is there a space for this? Considering access and logistics is important. Clear up too the next day. Who is responsible for this and what time does that need to happen by? You must see thousands of wedding pictures every year, how do you choose your favourites that feature in your annual magazine? I literally pour through every wedding we've shared that year and select the ones that have really stood out for me. 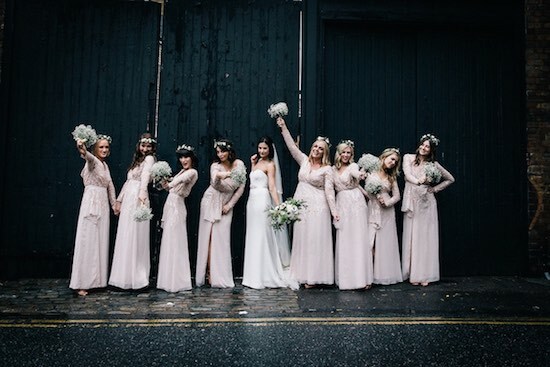 This can be for so many reasons, the story behind the wedding, the images, there might have been a particularly poignant and meaningful write up..
Visit our Shoreditch Studios listing on Love My Dress supplier directory Little Book.